More than 200,000 containers of Nestle Nesquik are being recalled. Nestle is recalling more than 200,000 canisters of its chocolate drink mix Nesquik because of possible contamination of salmonella. Nestle said the problem occurred on batches of the the mix produced in October. The bottom of the canister says it is best to use by October 2014. The size of the canisters affected are 40.7 ounces, 21.8 ounces, and 10.9 ounces. 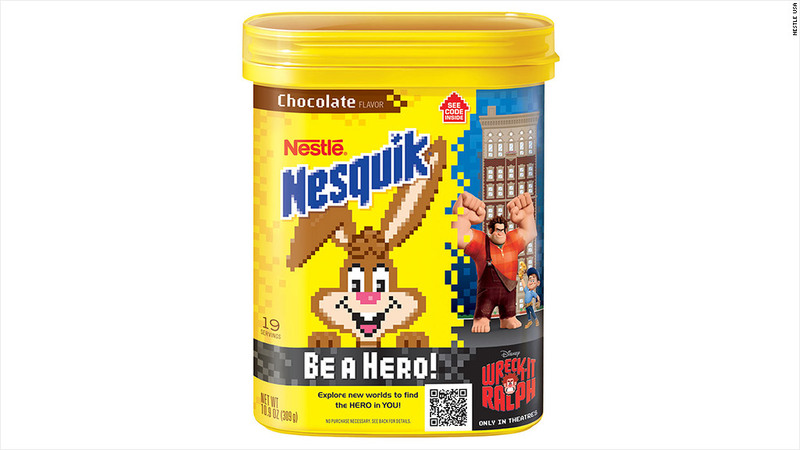 The two smaller containers have a promotion for the current Disney (DIS) movie "Wreck-It Ralph" on the side of the container and the words "Be a Hero" across the bottom. Nestle (NSRGF) said the problem was caused by ingredient supplier, Omya Inc. that it has issued a recall of certain lots of its ingredient, calcium carbonate. Linda Pleiman, an Omya spokesperson, said that it had notified its other customers of the problem but was not aware of any other recalls at this time. Nestle said that there have been no reports of illness due to anyone who consumed the product. Nestle said consumers who have the product can return to the place of purchase for a full refund or or contact Nestle Consumer Services at (800) 628-7679.